Denny Hamlin Fans » Blog Archive » Troubles “Haunt” Hamlin @ Pocono!! 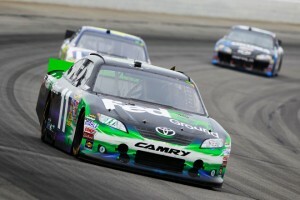 Troubles “Haunt” Hamlin @ Pocono!! After 2 laps Denny Hamlin began to dominate once again at Pocono. During the first half the race he went on to lead 74 laps, but a hung up lug nut forced him to wait in the pits a while longer on lap 77, causing him to loose the lead to driver Juan Montoya. The next set of green flag runs he was consistently chasing down the leader, cutting his 2nd place position to a few seconds everytime. Around the halfway point, Denny started to battle a tight race car, but was still able to keep himself in the top 5 running order. Unfortunately bad luck struck as a flat tire caused Hamlin to return to the pits following a restart on lap 159. The Culprit? A missing Valve Stem which seemed to continue to cause troubles for Hamlin including taking out his brakes. Hamlin was able to finish the race in the 19th position and after the race, Denny stated that he was frustrated because the car was extremely fast, but that nothing seemed to go smooth for them at all today. With this finish today, he now drops to 12th in points with 12 races remaining until the Chase officially begins.